Beyond proving that goal was just possible, Microsoft's software moved out of our homes and off our desks to power a variety of things such as healthcare systems and ATMs. This is often forgotten, but Microsoft has empowered people for years. Of course it's not always been plain sailing for Microsoft, especially in recent years. The core vision to empower people felt like it had been lost, and replaced by desperate and arrogant attempts to grasp onto their own power as it became eroded by competitors such as Apple and Google who have brought their own industry-changing innovations to market. Former leadership and friction between teams were often called-out as the reasons why Microsoft struggled to move fast in response to these emerging threats. But the company is full of talent, and a look into the Microsoft Research labs will quell any fears that the firm is unable to innovate. The problem the company has held over the past few years has been the ability to deliver. This has led to many employees jumping ship, a trend which has reversed in recent months as many have returned or Microsoft joined from competitors. That is the clearest sign of a company which has turned its fortunes around and is quickly becoming the place where people want to be. Gates wrote in his letter: "Under Satya's leadership, Microsoft is better positioned than ever to lead these advances. We have the resources to drive and solve tough problems. We are engaged in every facet of modern computing and have the deepest commitment to research in the industry. " But the biggest challenge for Microsoft is becoming the place that developers want to be. Getting people back creating for their ecosystem from new and lucrative platforms such as iOS and Android is not an easy task. Instead of coming out swinging at their Build conference this week, the company has come out embracing. Microsoft is making it easy to move your apps from Android, iOS, or even the web onto the newfangled Windows Store. 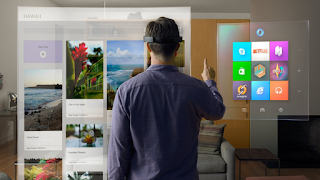 From there you are able to deploy to a wide-variety of devices including unique and exciting hardware such as HoloLens. HoloLens is Microsoft's biggest game-changer, and it is how the company can change the world if it has learned from its past mistakes. Nothing in technology has blown my mind as much as HoloLens and the potential it holds to make my geek dreams come true of creating a true virtual reality that is not just a gimmick. The demonstration where a user is able to customise their living space to their liking is cool, but we like to see new things with unlimited potential. When Apple introduced the iPhone and a unique new way of interacting with our devices, the boys and girls at Cupertino delivered just that. Microsoft has taken that a step further by interacting with any machine in a custom interface. Gates wrote: "I hope you will think about what you can do to make the power of technology accessible to everyone, to connect people to each other, and make personal computing available everywhere even as the very notion of what a PC delivers makes its way into all devices. " Microsoft rolled-out an unassuming robot based on a £ 30 Raspberry Pi 2, which offered the most impressive demonstration yet. At a voice command, the robot became a fully-manoeuvrable hologram which could display a variety of interactions to the user. What is so incredible about this is that it is accessible and allows anyone with the willpower to make cost-effective devices around the world; especially in this age of the Internet of Things. Councils and business could deploy assistants or interactive panels wherever users would benefit. As we mentioned earlier, Microsoft has been behind-the-scenes for decades providing the software to devices like healthcare systems and ATMs. Now the company will be powering the next-generation of "things". Imagine entering an ambulance and a hologram is already preparing the information it needs to provide to the paramedic, or that ATM having the appearance of an actual assistant rather than a 90s TV stuck in the wall. Microsoft is going back to its roots, and that is incredibly exciting. Whether it's the leadership of a talent like Satya Nadella, the return of Bill Gates as a key advisor, or the combination of both ... the company is back to empowering people, and machines. Do you feel that Microsoft has become exciting again? Let us know in the comments.